Though often confused as being the same disorder, psychopathy and sociopathy are two separate psychological diagnoses. They have some overlapping symptoms but are thought to arise from distinct causes related to nature and nurture. Certain people with these conditions can live unnoticed by those around them, while others get caught in the criminal justice system. While some become criminals, others are able to lead functional and successful lives. Two Cases: Can You Spot the Difference? Michael is a 57-year-old married man. He has been married to his wife, Patricia, for 34 wonderful years. Together, they have two teenage daughters and one younger son. Every morning, Michael takes the family dog for a walk, returns home for breakfast, and commutes into the city for his job as CEO of a Fortune 500 company. He is calculated and driven, and is known as a leader in his field. Michael seems successful, in every sense of the word. He has a lucrative job, a beautiful family, and a comfy upper-class home. Sean is a 32-year-old man who changes apartments whenever the lease expires. He is single and only finds himself in quick, casual relationships. He can’t hold a job, but when he is employed, his employers describe him as explosive and unreliable. He’s been in and out of jail, with a record of petty crime and disorderly conduct. He stays out late drinking, and the few friends he has know that he is a seasoned drug user. What do you think about Michael and Sean? Michael is a psychopath. Sean is a sociopath. Surprised? Don’t be. Sociopathy is easier to spot than psychopathy, but both disorders can fly under the radar. While Sean’s behavior is a good indication that something is wrong, Michael’s seemingly normal conduct doesn’t mean he’s off the hook. Contrary to popular belief, psychopath and sociopath are not interchangeable terms (that’s the fault of overgeneralization). As you can see from the case studies above, the two disorders are actually quite different. But how could the lives of a psychopath and a sociopath – both, types of Antisocial Personality Disorder (APD) – vary so drastically? Before we decipher the differences between the two, let’s take a look at the basics. Think of personality as a big puzzle. An individual with a personality disorder will have a few essential pieces missing. These missing pieces contribute to a pattern of “maladaptive” behavior that interferes with the entire spectrum of adult conduct considered to be normal and healthy. While “normal” is a hard term to define (who is actually normal anyway? ), I think we can agree that the symptoms of a personality disorder are unusual. An individual with a personality disorder will have symptoms that are ego-syntonic. This means that behaviors, values, and feelings are in congruence with the needs and goals of the ego, and the ego alone. There are three basic elements of personality (as outlined by Sigmund Freud) that are crucial in determining our behavior: the Ego, Id and Superego. The Ego’s job is to mediate between the Id and the Superego. When you ignore the other two parts and operate on the basis of Ego alone, you run into some behavioral issues. After all, looking out for “me” above all else sends up some red flags. Additionally, an individual with a personality disorder will have a low level of integration between the individual and the collective unconscious (according to Carl Jung). This lack of integration is associated with “Acting Out.” Sure, small children “act out” all the time (you have to wonder if they enjoy throwing temper tantrums), but it’s a little strange when an adult starts doing the same. Individuals with a personality disorder often act impulsively and irrationally. Some types of psychopathy appear to be culture-specific, only found in certain regions, and are bound to cultural concerns. Because different societies have varying norms of behaviors, a psychopath in one place may not be considered such in a different society or setting. Lack of conscience, guilt, or remorse. Awareness of, but presumed immunity from, standards (knowing the rules, but thinking they do not apply). Superficial, manipulative relationships (not generating authentic relationships, but rather using people for their own benefit). Failure to profit from experiences (never “learning a lesson” from past indiscretions). Now that we know what APD is, how do psychopathy and sociopathy come into play? These two separate classifications of antisocial personality disorder have been the subject of many debates throughout the psychological community. While some people use the terms interchangeably, we now know that the two conditions are different. Remember our Michael and Sean from above? Their behaviors were outwardly very different, but they both had forms of APD. So, what are the typical symptoms of psychopaths and sociopaths? Psychopaths such as Michael are often seen as charming and trustworthy individuals. They hold steady, normal jobs and are often quite successful. While psychopaths are unable to form meaningful relationships or attachments, some are able to fabricate seemingly loving relationships with partners and, in many cases, have families that are unaware of their condition. Michael had a wife, kids, and even a dog -- an outwardly unremarkable family situation that is less unusual for psychopaths than you might imagine. Sociopaths, like Sean, tend to be more impulsive and erratic, and in some cases prone to rage. This causes them to be less likely to have successful work and personal lives. However, despite their difficulties forming solid relationships, sociopaths are more likely to create close attachments to a few other individuals or groups than are psychopaths. Psychopaths may pretend to have close attachments to those around them, but have no true emotional connection. The people psychopaths surround themselves with are all part of the act. Simply put, psychopathy is a more severe form of sociopathy. While a sociopath may have a weak conscience, a psychopath may not have one at all. “The psychopath is callous, yet charming. He or she will con and manipulate others with charisma and intimidation and can effectively mimic feelings to present as “normal” to society. The psychopath is organized in their criminal thinking and behavior … Conversely, the sociopath is less organized in his or her demeanor; he or she might be nervous, easily agitated, and quick to display anger. A sociopath is more likely to spontaneously act out in inappropriate ways without thinking through the consequences.” – Kelly McAleer, Psy.D. So no, a psychopath doesn’t walk around in their dead mother’s nightgown à la Norman Bates in Psycho – unless that’s their personal style (hey, to each their own). But as with the fictional Bates, it is all in the act. Sociopaths and psychopaths differ in their ability to blend in. Of course, this rule is not absolute, but generally speaking, sociopaths are thought to be less able to disguise their true intentions. Additionally, some experts believe that sociopaths are more likely to be “hot-headed” and aggressive, while psychopaths mask their true selves (which tend not to feel emotions at all). If a psychopath acts aggressively, it’s probable that they are doing so intentionally in order to manipulate the situation or people around them. Now that we know the symptoms, let’s take a look at how someone might develop APD. We’ve all heard the age-old debate of “Nature versus Nurture” that has forever divided psychologists and theorists. While this is arguably the most debated premise in psychology, researchers have been able to resolve the dispute as it applies to APD: Psychopathy is determined genetically, i.e., “nature,” but sociopathy results from environmental factors, i.e., “nurture.” Environmental factors that may incline one to develop sociopathy include physical or emotional abuse, or severe trauma experienced during childhood. Psychopathy, on the other hand, is all about the brain. sociopaths make up an estimated 4%. Compared to healthy people, psychopaths have underdeveloped components of the brain – specifically in areas thought to be responsible for emotion and impulse control. They also may have physical differences that make it hard for them to identify the distress of others, and their basic bodily functions and responses are different than the normal population. For instance, when presented with violence in movies, a normal person will respond with a faster heartbeat, quick breathing, and sweaty palms. Conversely, a psychopath will get calmer when presented with the disturbing material. But don’t worry. Just because you don’t get scared during a gory movie doesn’t mean you’re a psychopath. Chances are, you’ve seen Christian Bale in American Psycho, but not all psychopaths and sociopaths behave in the way they are portrayed on the big screen. In movies and television, these individuals are usually depicted as sadistic villains. But contrary to how they are depicted in the media, sociopaths and psychopaths are often less violent. Instead of behaving violently, they will manipulate others for personal gain. That’s why such individuals, if committing a crime, tend to stick with white collar crimes. If involved in crime, a psychopath will typically plan carefully. Their calculated behavior minimizes the risks they may face. Any criminal behavior by a sociopath is more likely to be impulsive and unplanned. Check out Psychopath: Redefining Rational for a more in-depth look at psychopaths in the prison systems. Psychopath Interview from MagellanTV on Vimeo. Some experts estimate that 93% of psychopaths are in the criminal justice system, though it’s hard to calculate an actual number when you consider how they can blend into society and go undiagnosed and unnoticed. 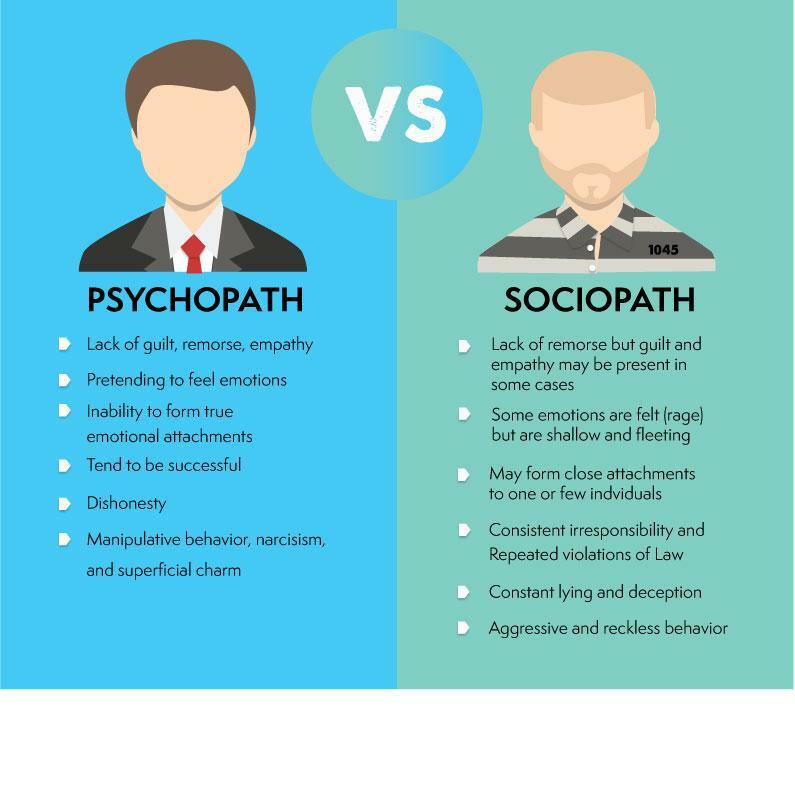 So you see, psychopaths and sociopaths are really quite different, despite both being forms of antisocial personality disorder. Some people with these conditions end up in and out of prison (like Sean), and others successfully hold top jobs (similar to Michael). While we’ve learned much about them, it’s still difficult determining if someone is a psychopath or sociopath – especially since they’re so good at acting normal. Researchers of these fascinating disorders hope to shed more light on them in the future. Until then, you’ll know the difference between the two … even if you don’t know who actually has one of them.